WordPress display only 15 posts in the “Manage” section by default. As a wordpress blogger or adminstrator, this can sometimes be quite limiting. Unfortuntely, there isn’t any known variables or parameters that you can pass through the URL to tell this section to return you with the number of posts that you would like to see. However, there’s a solution. Digging through the code got me to the solution. 4. Aha, posts_per_page! That’s what you will need to change. Change 15 to the number of posts you’ll want to see in the Manage section. I usually set mine to 50 anyway. That’s about it. Too bad the WordPress team didn’t even define a variable for that. It was simply hardcoded at 15! 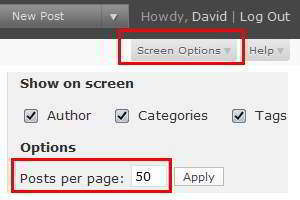 You wouldn’t need to do the above anymore in newer versions of wordpress as there is now a setting under screen options where you can determine how many posts/comments you want to see in edit/comments respectively. I don’t know if they’ve changed the file in v2.6.3, but the wp_edit_posts_query is no longer present in post.php. Care to update this procedure? WordPress 2.7 will be coming out real soon, so I’ll wait before doing any updates to this post. this post has been updated since wordpress can let you define how many posts you want to view in the manage (edit) post section. Please view screenshot above.